Thomas McCulloch was a Scots Presbyterian minister, an educator and a political reformer. He came to Pictou, Nova Scotia in 1803 from Scotland at the age of twenty-seven. He and his wife, Isabella, raised their family in this Scottish-style house. Here, among some of McCulloch's possessions—from his desk to items from his natural history collection—you can discover a man who wore many hats and had a talent for stirring up controversy. His views and opposition of the establishment left a lasting impact on Nova Scotia and eventually on Canada. McCulloch set up a school in his own home to educate the sons of Pictou, including his own. A schoolhouse had to be built on his property to accommodate the growing numbers. This schoolhouse burned down and was then rebuilt. McCulloch was the driving force for establishing a non-sectarian college in Nova Scotia, Pictou Academy, that was established in 1816 and began offering classes in 1817. The Pictou Academy started its operation in a private home until the academy building opened its doors in 1818. Thomas McCulloch died on September 9, 1843, at the age of 67. His house was owned by others after his death, the last owner being a woman who ran the lower level of the house as a museum open to the general public while living in the upper level. 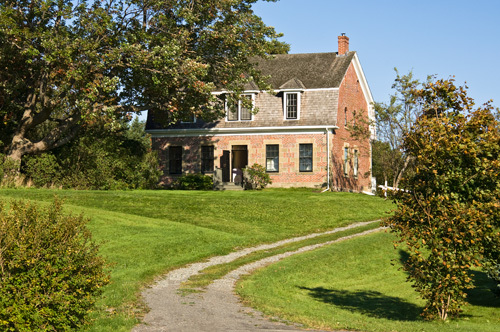 The McCulloch House is now operated by the Pictou County Genealogy and Heritage Society in conjunction with the McCulloch Heritage Centre on behalf of the province of Nova Scotia.